I remember a bit funny old incident that happened, when I was a school going lad. One of my cousin sisters had come to stay with us during summer school holidays. She was visibly homesick as she was staying away from her parents perhaps for the first time ever. In those days, no one had the instant communications capability of today, with mobile and e-mails and even a land line was something of a rarity. The only means of communication was a humble post card. The post cards sent to you would be delivered on your door step by a postman. However, if you have to send a post card to someone, there was no choice but to find a letter box nearest to your house or place of work, walk to it and drop your post card in the slot provided in it. The card would be surely delivered in next few days to the addressed. Coming back to my cousin, being terribly homesick, she decided to write a post card to her mom. I requested my dad to give me a blank post card, which he did, and then my cousin poured her heart's feelings on the card. After the card was written, we decided to make a foray to the nearest letter box. After finding the box, my cousin dropped the card in the letter box. I was standing on a side watching my cousin. After dropping the card she did something odd. She stood near the letter box for few seconds silently and then suddenly folded her hands together to show her obeisance (the Indian way of showing respect or reverence) to the letter box. At that time, I could not control my laughter. Later, during my college days, I attended a college, which was in a different city and for the first time in my life, started staying in a hostel, away from my parents and home. During my hostel years , two things, that were most dear to me, were the arrival of a postman with his bunch of letters and secondly a visit to the letter box to drop my weekly report to my mom. During those days, for the first time, I truly realized, why my cousin had folded her hands near the letter box, now many years ago. I never did that kind of thing, being much older, but I could connect in my mind to my cousin's wavelength and what she must have been thinking. 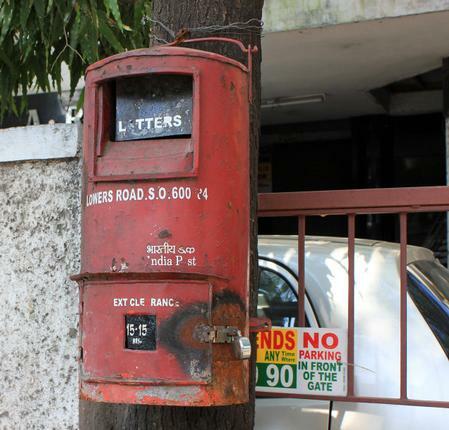 A letter box in those days was kind of a friend in any strange land, in India or abroad. Whenever I was travelling and had to stay in a strange place, the first thing that I would do was to locate a nearby letter box. That box would be my link to my world, my place and my people. There used to be two kind of letter boxes. The heavier once would be fixed on a concrete pedestal on a footpath. These boxes would be red coloured, bulky cylinders with a conical cap and had a slot near the top for letter dropping. A small hinged and padlocked door (usually very much rusted) near the bottom would be opened by a postman at some specific time to collect all the letters that have been deposited. The other type of letter boxes, though similar in construction, were much lighter and would be hung by means of a steel wire handle, which would be tied to a gate or some fence. This red letter box, a dear friend of the past, is going to disappear soon and would be replaced by a new letter box of a brand new design for a smart make over. 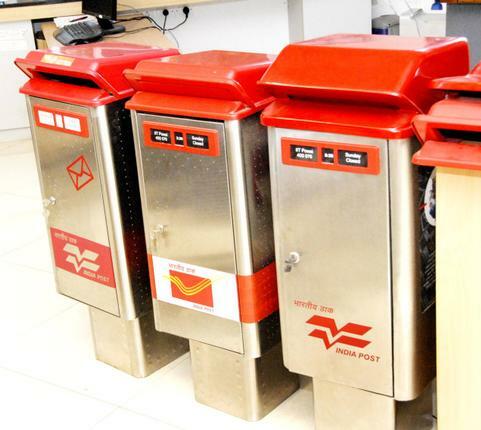 The Industrial Design Centre (IDC) at the Indian Institute of Technology, Bombay, has come up with a new designer letter box which has a stainless steel body with a red top. The IDC had offered several designs to the Department of Posts out of which one model has been selected. New boxes are made out of stainless steel, which makes them rust-proof, water proof and aesthetically attractive but without losing the traditional look. I am doubtful, if I would have to use a letter box any time in the future. But if I have to, I would surely be missing my old red man with the black hat, who is going to be replaced with this new man with his gleaming, shining armour. Goodbye old friend. We surely had great time together.